Do this make it a bit clearer? You can see the right hand side arm for the boot. Gotta be in the boot. Now I'm sure it will be repeated here. Yes its in the boot. The light is a little hard for the camera to pick up, so I put a cushion in and took the picture. You can see the door light in the picture as well. I didn't realise that there are two lights in the boot as I had only seen the one on the side, and had replaced that one along with the other light's, when I changed the bulbs to blue LED's. I only picked it up last night in the dark when I was putting some gear in the boot and saw a white light shining down from below the shelf. Changed the bulb tonight when I came home from work and it was only a 5 min job. The glove box light has the slot facing the back of the glove box so it is difficult to get a terminal screwdriver in it due to the lack of space. I do however have a little tool with a hook on it which I placed in the slot and with a little yank, out it popped. All the other's are easily removed. The only bulbs not changed in the interior are the two map lights on the ceiling, as if I turn them, on I will do so to read something, so a white light is best The middle one I changed to a blue led and it all looks a treat. NO drilling required and no wiring changes either. Simply remove the factory lens assembly from underneath the door using a small flat head screwdriver (one end of the lens is used for removal and easily pops-out), disconnect factory wire connector from the lens, connect the factory wire connector to the new lens, pop back in the new lens, and enjoy. They come marked for Left and Right side to help with identifying which door to put them in based upon the orientation of the logo. If we have none in stock we are taking back orders and we highly suggest you take advantage of that. Hey buddy, I just got round to fitting these and I have to say that the effect is awesome. One thing that bothers me is the passenger side is a tad askew. I know it isn't a big deal but it really annoys me. I have attached the passengers side and drivers side as a comparison. What's your thoughts? 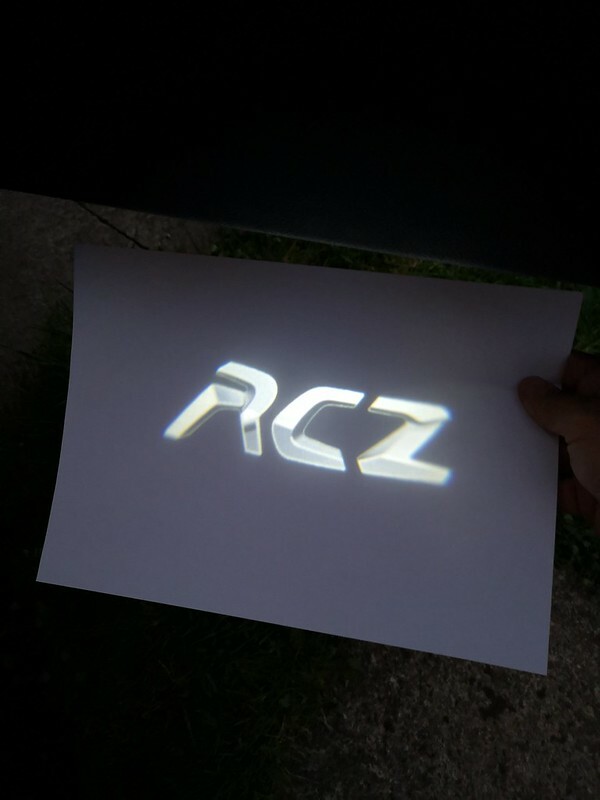 [quote="RCZ-Performance"]Street Performance UK (aka RCZ Performance) has exclusive rights to bring you 'RCZ' and RCZ 'R' Logo Projection Door Courtesy Lights'. As stated by DKZ5745, the barrel that the film is in can be rotated to your liking by using say a small screwdriver or similar and accessing the barrel (black) from the opening on the side of the lamp assembly. If you have any issues, please do not hesitate to contact me directly. I went and dropped the fucker and it smashed into pieces. Do you still have any left? 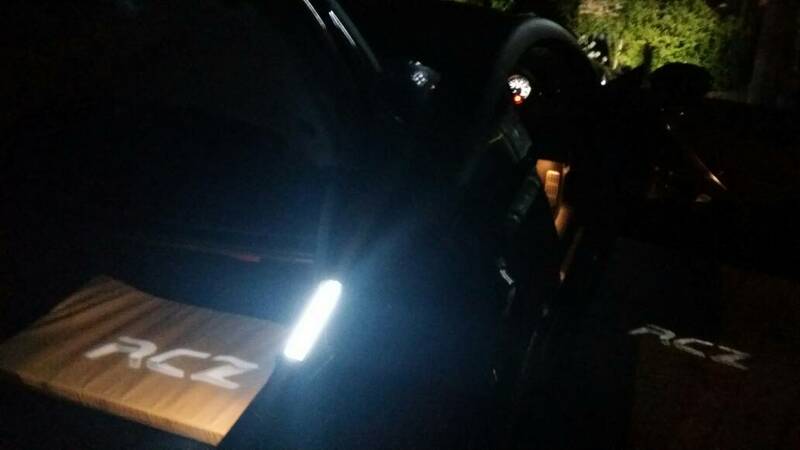 The 'RCZ' Door Courtesy Lights are back in stock !! !